‘Shin splints’ is a common term for pain or inflammation in the front and/or inside section of the tibia. The patient will complain of tightness/tenderness and sometimes throbbing pain along the border of the tibia that comes on with a specific activity (especially running and walking long distances) and often settles upon resting. Often, it will start like a dull ache but quickly becomes sharper and more aggravated. Anterior tibial stress is often experienced by new runners or walkers when pain occurs in the anterior muscles of the shin during exercise. Posterior shin splints (medial tibial pain) is a more chronic condition occurring along the inside edge of the tibia and generally occurs with over-use related sports. Both conditions are related to excess stretching (traction) of soft tissue structures along the shin bones (tibia and fibula). 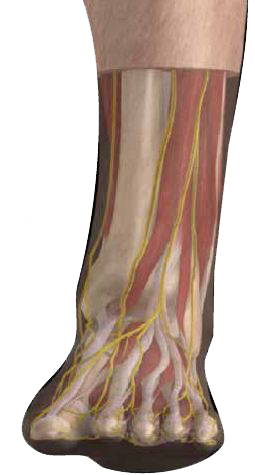 Excessive subtalar joint pronation and internal tibial rotation increase the medial tractional forces upon the deep flexors and extensors of the leg. This is a common factor in muscular overuse conditions and commonly exhibits secondary periosteal swelling due to tractional forces placed upon the soft tissue structures on the tibia and fibula. By preventing excess subtalar joint pronation orthotics assist reduction of internal tibial rotation and reduce medial tractional forces upon anterior tibialis and posterior tibialis muscles. This provides an effective solution to shin splints pain. Ice therapy (15 minutes, 3 times a day), rest from running, deep tissue massage. Stretching & strengthening of tibial muscles – sit on a chair and loop an ankle weight around the foot. Keep the leg straight and lift the foot up and d own from the ankle.